If you can’t bear to leave your four-legged family members at home, bring them along for a pet-friendly vacation. Here are our top tips for traveling with pets. Flying with your pet is actually a lot easier than it sounds as most airlines are quite animal-friendly. However, each airline has its own set of regulations’ find out about these before you book a flight to ensure you’ll be in compliance with all regulations. 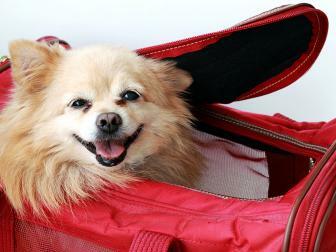 Most airlines extend 2 options to furry friends–carry-on or checked. You may already have a favorite pet carrier, but check with the airline to be sure it meets specific regulations. Guidelines for pet carriers vary depending on how your cat or dog will be flying. Small pets may come aboard as carry-on luggage in a hard or soft carrier and must be stored under the seat for the duration of the flight. Larger pets that will be checked to travel in cargo must fly in a non-collapsible carrier with an ample supply of water. In most cases, the weight of the animal and the carrier must not exceed 100 pounds. If you’re looking to travel by train or bus, you’re probably out of luck. Most national carriers do not permit animals, other than service pets, on board. That limits you to your car if you’re hoping to hit the open road. Car travel is more convenient because you can set your own schedule and have your furry friend nearby for the duration of the trip. There are some safety tips to consider. Don’t let your dog or cat ride in your lap in the front seat. Let them find a comfortable and safe spot in a back seat or keep your pet in a carrier to prevent them from roaming around the car and distracting you while driving. Talk to your vet before you embark on your trip to determine the best way to handle your dog or cat’s anxiety on the road. If your pet gets anxious in the car, your vet may recommend sedatives to ease their nerves and reduce car sickness. Pets can get sick on the road just like human passengers, but negotiating the barf bag is a bit trickier. Plan for plenty of pit stops along the way for fresh air and bathroom breaks. When it’s time for you to hit the rest stop, leave the window open a crack for ventilation and avoid leaving your pet in the car unattended for an extended amount of time. Extreme weather can be dangerous for animals. As more travelers set off on adventures with their pets, the hotel industry has responded with many pet-friendly options. High-end hotel chains, including the Four Seasons and Ritz Carlton, boutique hotels, like those in the Kimpton Group, and budget hotels, including Red Roof Inn and LaQuinta, all have pet-friendly properties. Check with individual hotels or on websites that consolidate information on pet-friendly lodging, like petswelcome.com. Check with the hotel about pet policies before checking in, and be prepared to pay an additional fee to bed down with your pet at night. Whether you’re renting a beach house or a mountainside ski chalet, don’t assume Fluffy is welcome without checking first. Some rentals have strict policies on pets, but many welcome animals for a fee. Websites like pettravel.com and HomeAway provide listings for animal-friendly rentals around the world. Finally, prepare for medical emergencies before you encounter any. Before you leave for your trip, research emergency vet clinics at your destination in case you require an unexpected trip to the animal doctor. If you decide to leave your pet at home, get recommendations for a good kennel close to home from fellow animal-lovers or on websites like KennelFinder.